I agree with your dining companion that no self-respecting Vietnamese would eat there. 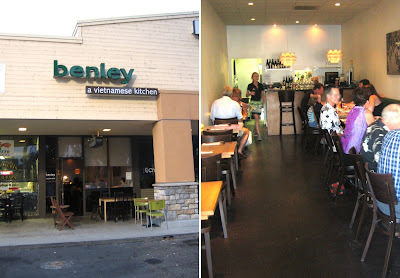 Benley reminds me of Pho Cafe in Silverlake. I had the overpriced bowl of pho which was small and I could not help thinking that I could get two bowls at Pho 79 for the same price. However, I found both the braised short rib and the "guacamole" to be lacking in seasoning. excellent review as always; thank you. piping up to say that cuttlefish is different from squid. battered and fried, it'd be hard to distinguish, but they're actually different creatures! i much prefer cuttlefish, though my science friends tell me that cuttlefish and octopus are scarily smart and thus a little hard to swallow without pangs. squid, however? safely dumb. Another great review and another place for DB to try out! How funny, my roomie and I were having dinner with a friend at Lomeli's in Brea and they were just talking about how great Cafe Hiro was (I was talking about Nory's the Japanese Peruvian place too). Sioux5ita. If you are looking for quantity over quality you obviously wont' be satisfied with Benley.. but the Pho broth / meat/ noodles are far superior to Pho 79. Elmo, try the flattened chicken if you go again as well as the stir fried filet mignon. This restaurant in on the corner of Wardlow and Norwalk ( Los Alamitos)? Near TJ MAX?. I always thought they are part of Los Alamitos or Cypress. Good review as always. Interesting concept. Maybe I should try it one of these days. OH I read another entry about this place earlier in the week... I guess it's getting some buzz in the foodie community, and that great minds think alike! How could you? But yeah, I've heard of this place, and knew they weren't aimed at me. Like Viet Noodle Bar. Ick! 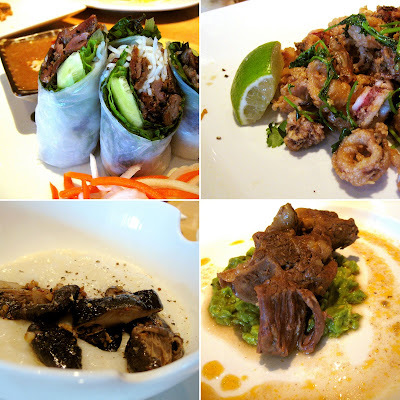 I loved the Slanted Door last time I visited SF. 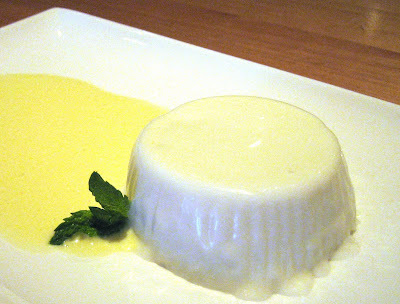 I'm also thinking about eating at Cafe Hiro tonight.... All that said.. I'm glad you found me another good eatery that I must try. It's funny because Cafe Hiro has the same sort of prices, but no one blinks because all Japanese food is expensive. So I guess, Cafe Hiro doesn't stick out as much as Benley does. It's only when you try to upclass Mexican or Vietnamese (two of the traditionally the cheaper ethnic foods) that people start noticing the prices. Ahh! A fellow science geek. Yes, I was wondering when I was going to get called out on my cuttlefish comment. And you are right. They are, indeed, different creatures! And they do taste smarter, now that I think about it! Cafe Hiro is still great isn't it? I finally tried the uni spaghetti last week and it was everything everyone said it would be. Flattened chicken eh? That sounds yummy. Sounds like brick chicken, which I've always wanted to try. HAHA! So did you spit what you were drinking all over your computer screen? I bet you did! Yes it is the same one you speak of. I also thought that it was Los Alamitos. And are you the same Beach that took us to Pagolac? Your profile link suggests that you aren't, but just in case you are, I am honored to have you comment on my blog once again, oh "Don of Little Saigon". If you aren't, then I shall call you Beach Jr.! Like Michael Corleone. You are either a self-respecting Vietnamese or someone familiar with Bolsa then! HAHA! I had to put in that warning for exactly that reason. I know my audience...and they're just like me! Except I REALLY liked this place! A lot! Aw shucks. You know I can't pay you to say such nice things. But thanks. Viet Noodle Bar. Even the name makes me shudder. Your comment makes me long for a pumpkin soup. Like right now! Elmo, I am Vietnamese, and I kept reading, and still loved your review! I wouldn't mind eating there, because no self-respecting Vietnamese would eat my food either--thus meaning that I am not self-respecting. Haha, you got me. I'm not Vietnamese, but I died a little inside when I read that people would pay those prices for a bowl of pho. I eat it pretty much monthly and I guess that maybe if it was THAT good, I'd consider trying it. I still find those prices mildly ludicrous though. i'm glad anna gave the lesson about cuttlefish and calamari being different. it's actually a lot more tender and i think that is what makes it better. while on the topic of battered and salted things at benley... try the salted shrimps. they are an entree but great to share. they are tender, whole shrimp and you eat the whole thing... head, shell and all. the tasty batter is on the outside and the shells just melt away. 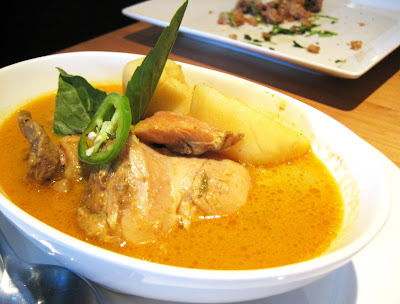 plus, they top it with a jalapeno, lemongrass mixture for an extra kick. (14.95) but worth it. it's not easy to find a place that sells the whole shrimp, battered and fried fresh to order. hooray for benley! You just blew my mind. My head is still spinning. But yes, the place is meant to be enjoyed with an open mind, which you are obviously in possession of! Yeah, I couldn't bring myself to get the pho either. But the other stuff is done well. Worth the price? Well that depends on who you ask! I eyed that dish...and was *this* close to ordering it. Just means I have something to try next time! Thanks for confirming its greatness. I relish a good fried shrimp with edible shells. yeah, like most vietnamese or maybe most asian parents, mine gave me the guilt trip for spending $9 on a bowl of pho at the slanted door, or even $6 for banh mi at break of dawn. but if people are willing to pay for it, and they're introduced to new cuisine, no matter what country it's from, i'm all for it. hopefully, when they come to try the "authentic" neighborhood Bolsa version of $5 pho or $2 banh mi, they'll be that much more delighted. Excellent point! I hadn't thought of it like that before! Yes, if I were new to Vietnamese cuisine and this was the first place I had it, I'd take my new found appreciation to its epicenter and do everything to pay less for it if I could. Of course, I'm like that...cheap! Don't think of it as a Vietnamese restaurant. It's really more of an Vietnamese-influenced restaurant. The food is incredibly good and at these prices it's no surprise they are lined up out the door to get in her on weekends. Great little find. Great point! And you're right. I didn't mention it in the review, because I just plum forgot, but there was a line. I had to wait for a table. ever order wine there? i did, what a surprise! what i thought was a $5.50 pinot noit glass, cost 11 bucks. menu code: s-g-b, defined as splash-glass-bottle. heck, what's a splash? cafe hiro tops my list, and a glass of wine costs less.